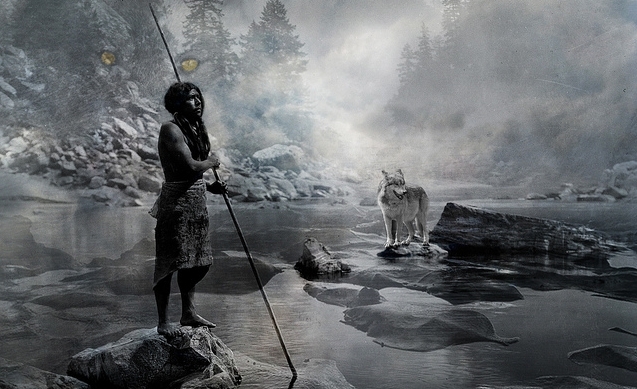 Wolves have held a special place in almost all Native American tribes. They were admired for their strength and powers of endurance, and taught the tribes many skills. They taught the tribes about sharing, cooperating, looking after the young and having pride. They showed the native people how to move in the forests -- carefully and quietly. By living courageously and faithfully, we experience the wonder of being alive, where everything is possible ..."The Wolves Followed A Path Of Harmony, And They Did Not Like Anything To Upset Their Way." "Wolf Was Chosen By The Great One To Teach The Human People How To Live In Harmony In Their Families. Wolf Was To Teach A Truth, As Each Animal... Would Do Also For The Humans To Survive. Did you know? The Navajo word for wolf, "mai-coh," also means witch, and a person could transform if he or she donned a wolf skin. So the Europeans were not the only ones with werewolf legends. However, the American tribes have an overwhelming tendency to look upon the wolf in a much more favorable light. The Navajo themselves have healing ceremonies which call upon Powers to restore peace and harmony to the ill, and the wolf is one such Power. Responses to "The Importance of Wolves in Native American Cultures"
beautiful story...there are also wild dogs in Israel, Africa and Australia with fascinating societies. The dingo was a food source. Pups were taken from the wild when weaned, fed on scraps and eaten when big enough.